In 1934, P. V. Cerenkov observed the emission of blue light from a bottle of water subjected to radioactive bombardment. This phenomenon is so-called Cerenkov radiation (CR), associated with charged particles moving at speed faster than the speed of light in the medium. The coherent radiation is observable at a conical wavefront defined by Cerenkov angle θ = arccos(v′/v), where v is the speed of the moving charged particle, and v′ is the phase velocity of the radiation wave. CR has been proved to be of great importance in subsequent experimental work in nuclear physics, and extensively used in experiments for counting and identifying relativistic particles. A recent work reported the observations of coherent, impulsive radio Cerenkov radiation from electromagnetic showers in solid ice. Light can also create such an emission, which always involves a nonlinear optical process. So we call that nonlinear Cerenkov radiation (NCR). Unlike CR from particles, NCR results from nonlinear polarization driven by light field. The earliest work is Cerenkov second harmonic generation (SHG) in ZnS waveguide. The waveguide configuration has been widely studied since 1970. Cerenkov SHG has been considered as an important method to effectively achieve visible light because it has no strict requirements of waveguide parameters and the maximum nonlinear coefficient of the material can be used. And recently we reported Cerenkov sum-frequency generation in waveguide configuration . Another NCR configuration is optical beating by extreme short pulse, which is a hot field because it can realize THz emission. When a new physical phenomenon is discovered, people will think about two questions, how to use it and how to modify it for better use. CR is important in particle physics. NCR also has a lot of potential applications, for example, multiple photonic detection, THz waves and spectral analysis etc. However, both CR and NCR have a limiting condition, the speed of the source (charged particle for CR and nonlinear polarization for NCR) has to exceed the velocity of emission in the medium. This makes it not convenient to apply this phenomenon in some cases. Can we change that? The answer is yes, at least for NCR. Up to now, there are three methods to finish this task, phonon-assistance, photonic crystal and nonlinear photonic crystal. All the three methods can realize Cerenkov radiation below the light threshold. And all these methods are based on the fact that the phase velocity of radiation source, linear or nonlinear polarization, could be changed by the interaction between the light and the medium. In our work, nonlinear photonic crystal waveguide is used. This is a waveguide with the periodical modulation of χ(2), which may assist in accelerating or retarding the phase velocity vp of nonlinear polarization, even changing its direction, thereby modulating the behavior of NCR, such as threshold value, radiation angle and direction. The increase of velocity depends on the period of nonlinear photonic crystal. Smaller the period, larger the increase. Therefore, in principle, this method can realize NCR without velocity threshold and with any second-order optical parameter process. This can realize more applications of NCR, such as photonic entanglement, quantum communication and computation networks. 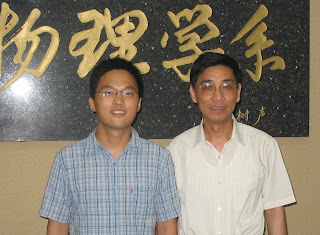 Y. Zhang, Z. D. Gao, Z. Qi and S. N. Zhu, Phys. Rev. Lett. 100, 163904 (2008). Abstract Link. P. A. Čerenkov, Dokl. Akad. Nauk SSSR 2, 451 (1934). “Optical second harmonic generation in form of coherent Cerenkov radiation form a thin-film waveguide”, P. K. Tien, R. Ulrich, and R. J. Martin, Appl. Phys. Lett. 17, 447 (1970). Abstract Link. T. E. Stevens, J. K. Wahlstrand, J. Kuhl, R. Merlin, Science 291, 627 (2001). Abstract Link. Science 299, 368 (2003). Abstract Link. Phys. Rev. Lett. 99, 171101 (2007). Abstract Link. Appl. Phys. Lett. 89, 171113 (2006). Abstract Link.